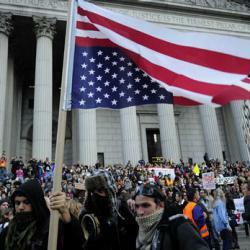 What Occupy Wall Street, the Arab Spring, the Chilean students, and other global protest movements all have in common. Why almost every continent on Earth is experiencing social and political turmoil. Social and political instability has gone global. This year alone, masses of people have poured into the real and virtual streets: the Arab Spring; riots in London; Israel’s middle-class protests against high housing prices and an inflationary squeeze on living standards; protesting Chilean students; the destruction in Germany of the expensive cars of “fat cats”; India’s movement against corruption; mounting unhappiness with corruption and inequality in China; and now the Occupy Wall Street movement in New York and across the United States. While these protests have no unified theme, they express in different ways the serious concerns of the world’s working and middle classes about their prospects in the face of the growing concentration of power among economic, financial, and political elites. There is high unemployment and underemployment in advanced and emerging economies. There is resentment against corruption, including legalized forms like lobbying. Young people have inadequate skills and education to compete in a globalized world. And income and wealth inequality is sharply rising in advanced and fast-growing emerging-market economies. This malaise cannot be reduced to one factor. For example, the rise in inequality has many causes. Some 2.3 billion Chinese and Indians are now in the global labor force, reducing the jobs and wages of unskilled blue-collar and off-shorable white-collar workers in advanced economies. Skill-biased technological change, winner-take-all effects, and less progressive taxation all have an impact. The increase in private- and public-sector leverage, and the related asset and credit bubbles, are partly the result of inequality. Mediocre income growth for everyone but the rich in the last few decades opened a gap between incomes and spending aspirations. In Anglo-Saxon countries, the response was to democratize credit—via financial liberalization—thereby fueling a rise in private debt as households borrowed to make up the difference. In Europe, the gap was filled by public services—free education, health care, etc.—that were not fully financed by taxes, fueling public deficits and debt. In both cases, debt levels eventually became unsustainable. Firms in advanced economies are now cutting jobs, owing to inadequate final demand, which has led to excess capacity and uncertainty about future demand. But cutting jobs weakens final demand further, because it reduces labor income and increases inequality. Because a firm’s labor costs are someone else’s labor income and demand, what is rational for one firm is destructive in the aggregate. The result is that free markets don’t generate enough final demand. In the United States, for example, slashing labor costs has sharply reduced the share of labor income in GDP. With credit exhausted, the effects on aggregate demand of decades of redistribution of income and wealth— from labor to capital, from wages to profits, from poor to rich, and from households to corporate firms—have become severe, owing to the lower marginal propensity to spend. The problem is not new. Karl Marx oversold socialism, but he was right in claiming that globalization, unfettered financial capitalism, and redistribution of income and wealth from labor to capital could lead capitalism to self-destruct. As he argued, unregulated capitalism can lead to regular bouts of over-capacity, under-consumption, and the recurrence of destructive financial crises, fueled by credit bubbles and asset-price booms and busts. Even before the Great Depression, Europe’s enlightened bourgeois classes recognized that, to avoid revolution, workers’ rights needed to be protected, wage and labor conditions improved, and a welfare state created to redistribute wealth and finance public goods—education, health care, and a social safety net. The push toward a modern welfare state accelerated after the Great Depression, when the state took on the responsibility for macroeconomic stabilization. This was a role that required the maintenance of a large middle class by widening the provision of public goods through progressive taxation and fostering economic opportunity for all. Thus, the rise of the social welfare state was a response (often of market-oriented liberal democracies) to the threat of popular revolutions, socialism, and communism as the frequency and severity of economic and financial crises increased. Three decades of relative social and economic stability then ensued, the so-called “Great Compression” from the late 1940s until the mid-1970s, when inequality fell sharply and median incomes grew rapidly. But the laissez-faire Anglo-Saxon model has also now failed miserably. To stabilize market-oriented economies requires a return to the right balance between markets and provision of public goods. That means moving away from both the Anglo-Saxon model of unregulated markets and the continental European model of deficit-driven welfare states. Even an alternative “Asian” growth model—if there really is one—has not prevented a rise in inequality in China, India, and elsewhere. Any economic model that does not properly address inequality will eventually face a crisis of legitimacy. Unless the relative economic roles of the market and the state are rebalanced, the protests of 2011 will become more severe, with social and political instability eventually harming long-term economic growth and welfare.